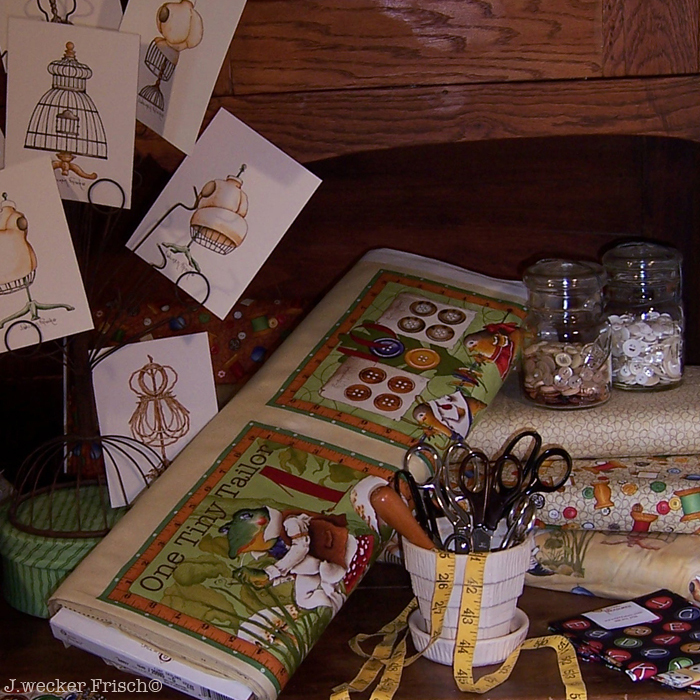 As a prelude to the 2012 Atlanta (Winter) Gift Market and a creative new year, a group of artist friends and I invite you to A New Years Studio Meet & Greet blog hop. 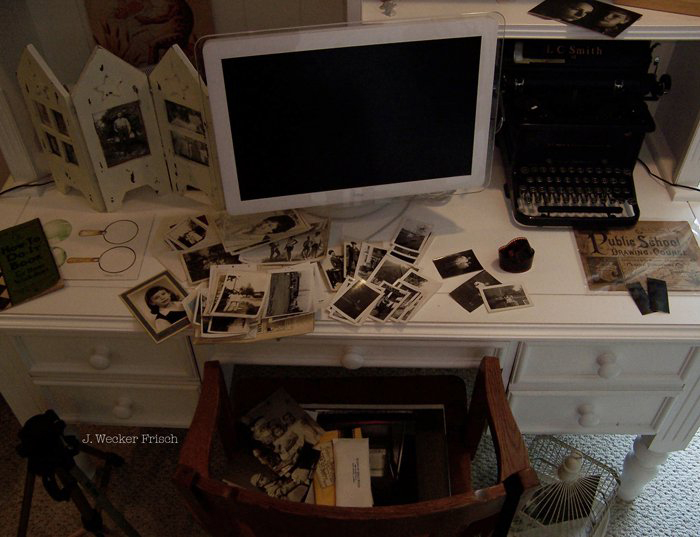 If creativity is your muse then you will enjoy seeing these unique artist‘s inspiring work and an introduction to their creative digs. Twelve artists in all will be sharing their work space, medium, inspiration and new collections of work. Growing up, I remember my mom was always busy ‘upstairs,’ taking care of the numerous tasks that make a home clean and run efficiently. 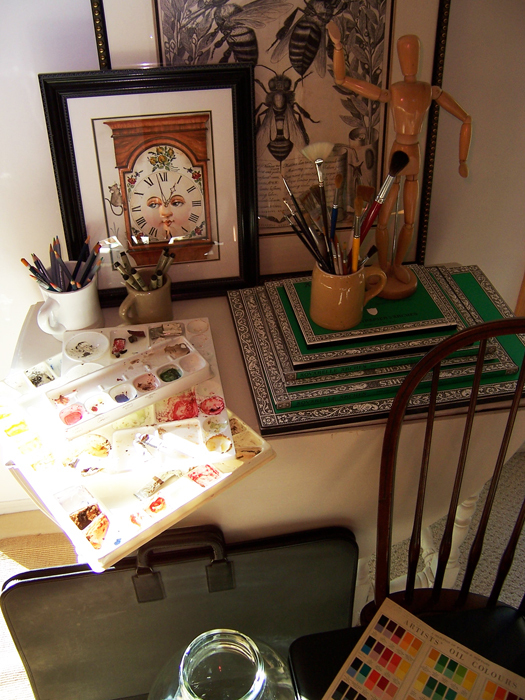 Meanwhile, ‘downstairs,’ all the fun was happening, in my dad’s home art studio! Both of my parent’s talents and skills combined, made it seem as though, everything imaginable, was right there for the making. Somewhere, throughout the family home, one could find it all. All of the good stuff that is, which goes into… well.. making stuff! It was a dream and one that I seem to have carried on in my own home studio. Whatever is required to construct or create any variety of arts or crafts, I always seem to have, or a similar item that would work as well. That fact no longer amazes my daughters and in fact, they often count on it. It is the first place they check to find a particular needful or unique item that would be perfect to complete their own project. I’m sure that my ample supply system, although sometimes bulging at the seams, is not so very different than my artist friend colleagues. I believe we’re all quite content to be surrounded with just enough (lots) interesting yet inspiring, stuff. The more (stuff), the merrier although, I do not like admitting it as some might consider my studio to be stuffed with stuff! Besides all that was acquired on my own through the years, I also surrounded myself with my dad’s tools of the trade, which happen to be, the heart of my studio. His small first drawing table for instance, (pictured above, complete with a 1950s pencil sharpener still firmly attached) is my favorite place to seriously sketch as I begin each new line. There is something poignantly personal to create not only using all that my dad taught me about art, but to be drawing, sculpting or painting while using the tools he also held as he skillfully created. Then of course there’s the fabric! A large fabric wall provides the color source in my work space. 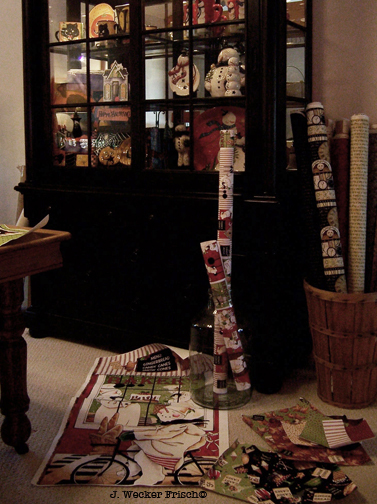 The two holiday lines, “Creepers Peepers” and “Bakers Dozen” (pictured above) are new for 2012. Check back here for availability. 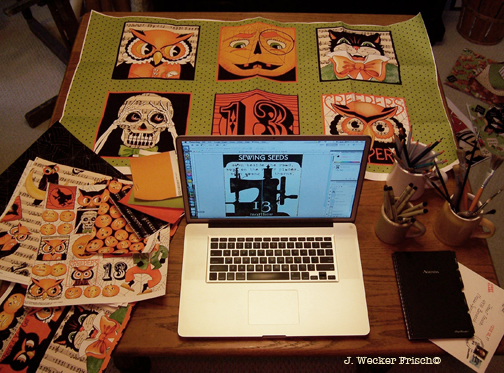 The joy of working with fabric design and quilters has also brought me home – to my sewing roots. 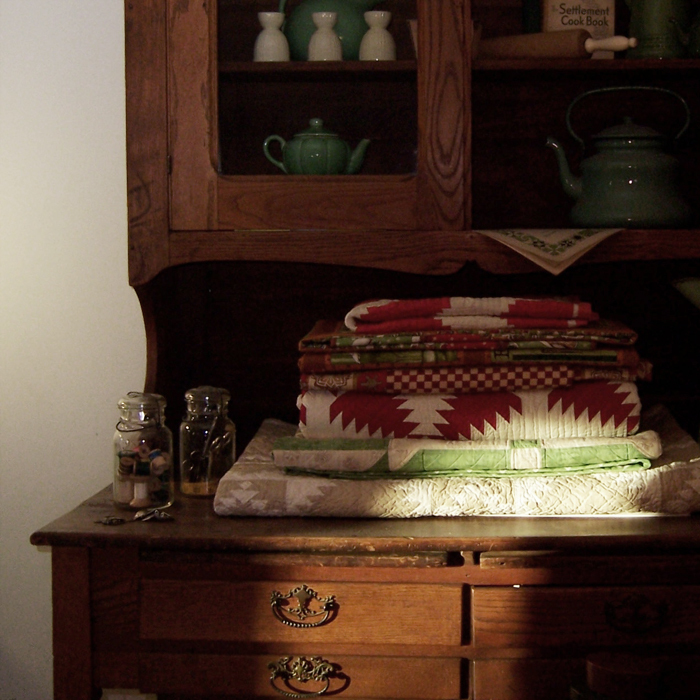 The sewing skills in our family, was all mom. And the baking. And the home making. And the nurturing, etc. And the disciplined structure . . . which continues to elude me as a life style, somewhat. So, I remain an aspiring artist who is just on the cusp of organized. Maybe THIS year! Currently I’m finishing up on a fabric collection that brings me full circle so to speak, and incidentally has come about (from a personal perspective) in God’s perfect time. It combines the art with the sewing and a sprinkling of Spiritual seeds seeking to take root, in your fabric stash perhaps. 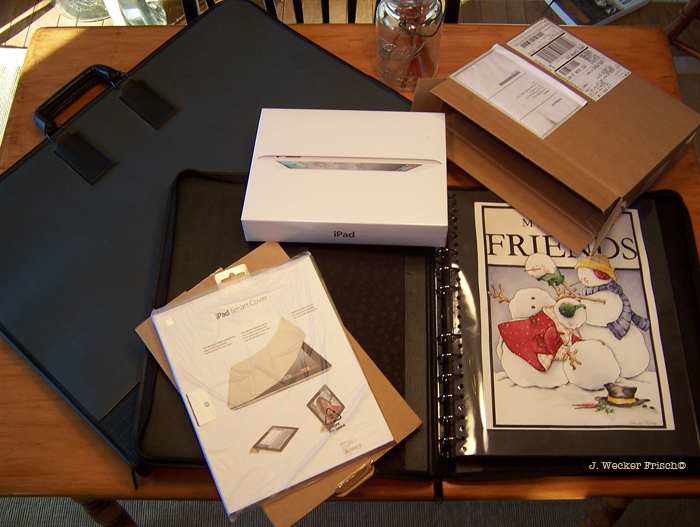 So, with my new iPad portfolio in hand, wide eyed enthusiasm in it’s proper place, I’m heading out again, to share with the world, the Tidings of Great Joy. Ahead for 2012 – Wishing you all of the comfort, and joy in the coming year that the Creator through creating, has brought to me. i LOVE the J.O.Y. pillows! 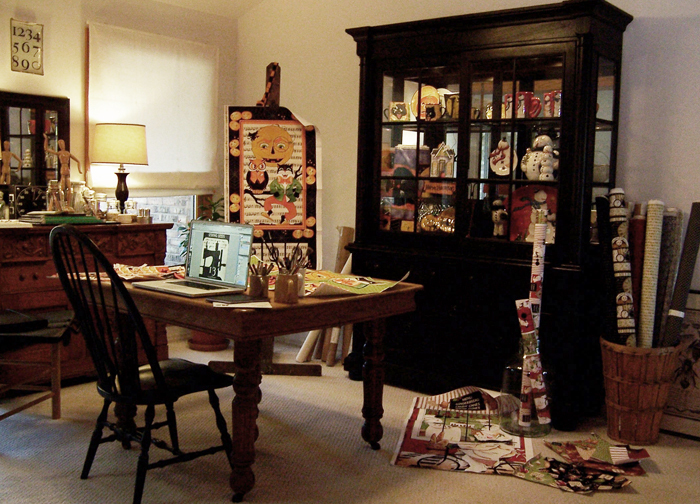 Janet… what a delightful look into your creative space! 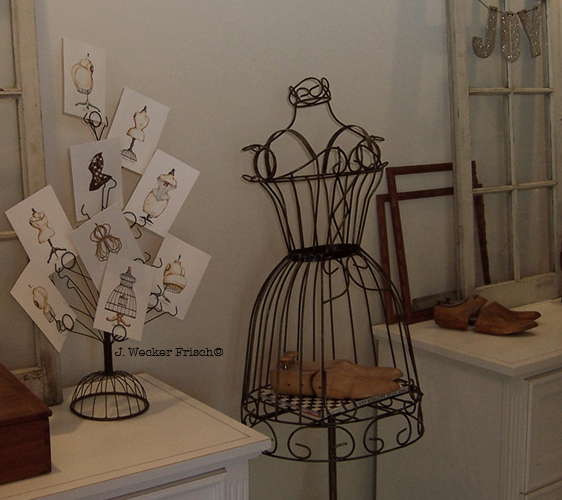 I just love the old wooden drawing table place in front of the window. I think I could sit there for hours! This is such a great post. I am linking to all the sites and am truly inspired. I always love seeing your work space. You are so NEAT and ORGANIZED. Makes me want to get up right now and put some order in my chaotic studio. 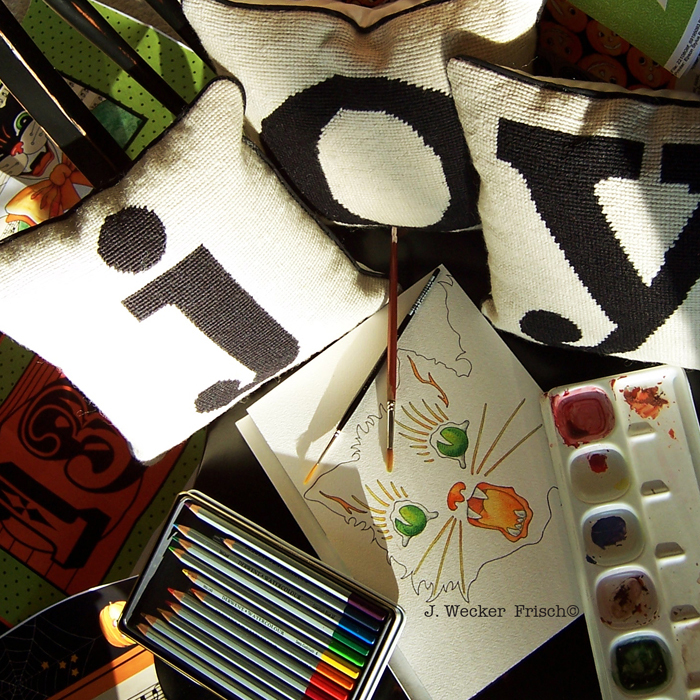 Your studio is a JOY! You are so lucky to have your father’s tools! Your studio is GORGEOUS and unique.. just like your art! LOVE IT!! 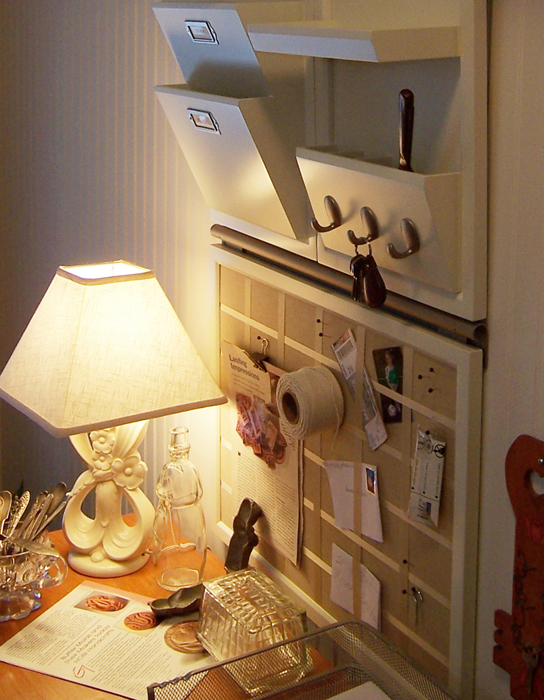 Janet – I love your studio – I especially love the things that used to belong to your dad! My father was also an artist and there is nothing like the treasured memories of learning from a DAD. I look forward to meeting you in Atlanta! Such a warm and inviting studio! Love it! So imaginative and evocative… what a peaceful space in which to create. 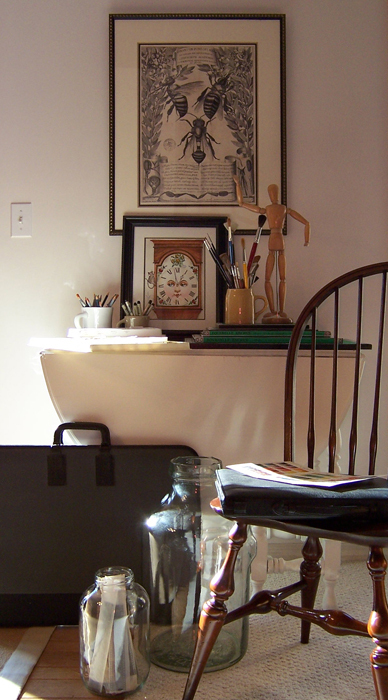 Janet, your work space is so warm and welcoming- thank you for showing it. I have my Dad’s sign lettering brushes and my Mom’s oil paints, which are now hard as a rock but I still keep them near. Janet, I’m so glad you jumped in on the hop. It’s been a pleasure getting to know you and now seeing your studio. Such talent, such ambition and now you’re a techie geek….ha ha! Best to you, thanks for sharing it all! I really love your studio, it is really beautiful the way you have everything set up. I really enjoyed hearing about your dad also and your inspiration growing up. See you very soon! Enjoyed seeing your place Janet. What a nice place to work-no wonder your work is so fabulous. I love how you have a piece of your Dad’s in your studio! How completely appropriate to pass down to his daughter who shares the same talent. You are an amazing artist. Your studio has so many fun elements. Thanks for sharing! Pingback: » Blog Archive » Hi Resolution – New Years Studio Meet and Greet! Janet, it’s a great place! And really nice to have a peek into your surroundings. I like the new cabinet. Pretty!